One thing I have learned over the years is that most of my wildlife neighbors are opportunists. As such, they take advantage of whatever food sources are available to them. Currently, since four o'clock are in full bloom, a handful of nectar feeders are homing in on this colorful garden favorite. Having graced Peach State backyards for generations, four o’clocks are familiar to most Georgia gardeners. However, I have noticed that, for some reason, it seems I more often see them growing around older homes. Perhaps this is because younger generations of homeowners have been slow to embrace them. Four o'clock are hardy, bushy perennials that can grow more than 4 feet tall. They can be easily propagated from seeds and their thick, fleshy roots. From midsummer well into autumn, four o'clocks produce bouquets of fragrant blossoms. In fact, the plants will often bloom until the first frost. The blossoms are trumpet-shaped and typically are red, pink, yellow or white. It is believed that this flowering plant earned its name from the fact that its blossoms open in mid-afternoon and don't close until the next morning. My wife and I have been growing four o'clocks for years and have found that the only thing we don't like about them is how easily they spread. Indeed, unless you keep them at bay, they will quickly take over a bed containing other flowers. With that in mind, I would recommend that if you start growing four o'clocks, plant them in a garden all by themselves. For the last few weeks, we have enjoyed watching cloudless sulphur butterflies, ruby-throated hummingbirds and Carolina sphinx moths feeding at four o'clock blooms. While some cloudless sulphurs and hummingbirds try to feed at the closed flowers throughout the day, most of the feeding activity doesn't really get going until shadows begin to fall across our backyard. As the shadows lengthen, four o'clock blooms begin to unfurl. Once the beautiful flowers open, cloudless sulphurs fly in, land on a bloom and begin feeding. It is fascinating to watch a cloudless sulphur thrust its long proboscis as deep as it can into the throat of a four o'clock blossom. In an effort to get every last drop of nectar out, the butterfly will often stick its entire head into the mouth of the flower. Rubythroats employ a different feeding strategy. They dart up to a flower and poke and their long bills and tongues deep into the deepest recesses of the blooms. Just before dark, after the cloudless sulphurs and ruby-throated hummingbirds have called it a day, the final act of this wildlife drama begins. Suddenly out of nowhere, a moth that seems to be even larger than a hummingbird appears and hovers briefly in front of flower after flower. Since its proboscis is much longer than that of a cloudless sulphur, as well as the bill of a hummingbird, the feeding moth never gets as close to a flower as the cloudless sulphur or hummingbird. This is the Carolina sphinx, one of a number of moths we often call hummingbird moths. Some nights only one or two moths will appear. This summer the most we have seen in one evening has been five. These feeding forays will continue until well after the sun sets. Consequently, it is often difficult to discern any of the moth's detail. However, since these large moths are remarkably tame, you can photograph them using a camera equipped with a flash. If you have a difficult time telling when a moth is in front of your camera lens, hold your camera in one hand and a small hand-held flashlight in the other. Direct the flashlight's beam on a feeding moth, move the camera in position, and snap a picture. With a little practice, you will find that it is easier than you think. 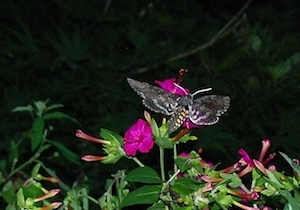 While other moth species are drawn to four o'clock blooms, you will know the Carolina sphinx when you see it. This moth has six pairs of large yellow spots running down its abdomen. The moth's wings will be gray with white and black markings. Although you might not be familiar with adult Carolina sphinx moths, if you raise tomatoes, I am sure that you have met its caterpillar a time or two. Carolina sphinx caterpillars will dine on the stems, leaves and fruit of tomatoes. It also feeds on tobacco and potato plants. However, most never bother crop plants. These caterpillars also eat ground cherry and members of the nightshade family. The caterpillars are large, sometimes as big around as your finger. They are green and marked with seven diagonal white lines. They also sport red horns. If four o'clocks are blooming in your backyard, I urge you to spend a few minutes late one evening looking for the nighttime flight of the Carolina sphinx. If you don't have any four o'clocks, plant some and next summer you will have an excellent chance at discovering why four o'clock time is so special. By the time autumn officially arrives, the fall migration of many migratory birds such as warblers, flycatchers and vireos has passed us by. Backyards that harbor an abundance of wildlife are indeed special places. We enjoy all sorts of parties.